What’s for dinner tonight? Beef? Chicken? No clue? Meal planning on a budget can be SUCH a PAIN in the behind sometimes, can’t it? You’re trying to save money, stay on your budget, and figure out options your whole family will like (or at least EAT) that won’t take FOREVER in the kitchen. You want to use up ingredients, but sometimes it’s hard to know what will stretch to make more meals…or worse, you get all set up and ready, only to find you're missing ONE thing and you have to run to the store AGAIN. Great news! Meal planning on a budget doesn't have to be super hard! In fact, with just a little bit of work, you can come up with a cheap meal plan (or multiple cheap meal plans) pretty easily. It takes maybe an hour or two the first time, but I swear, after that, it gets easier and easier. Meal planning often fails because it becomes way too complicated. With coupons, special ingredients, trips to the store, recipes, and binders, it’s enough to make anyone feel overwhelmed and ready to throw in the towel (or apron). Cue meal planning on a budget apps. Sounds great, right? Yet there are a ton out there…and who wants to spend HOURS figuring out which one is best, trying to input all your information, and getting insanely frustrated? NOT. ME. Plus, many meal planning apps are expensive (or at least cost something). However, there are some really great meal planning tools out there (like MyFreezEasy, which I really like and recommend, especially for freezer meal planning). But if you’re just getting started, you might want to begin by creating your own meal plans until you get the hang of it. The other issue is that many meal plans actually end up costing MORE because they require one-trick ponies and special ingredients for a single recipe. When you’re meal planning on a budget you can’t afford to go out and buy capers, almond flour, or miso paste. I mean seriously guys, I have NO idea what to do with those ingredients or how I'd use them up in other ways. Do you? Well, not to worry—with easy budget meal planning, you can save time and money without resorting to fast food all the time. You can do this! Here’s how to get started. The first thing I want you to do is print out this easy meal planning worksheet. Print several copies and hole-punch them or put them in sheet protectors in a binder. Do you ever think back to an awesome meal you made, but you can’t quite remember what was in it or why it turned out so well? This happens to ALL of us. So while lots of people use dry-erase sheets for meal planning or toss their sheets after the week is over, I say: DON'T DO IT. Your meal planning sheets are a great reference! You’ll end up with a binder FULL of meal plans you can refer back to over and over. It really helps, so save your meal planning sheets! There are several types of meal plans out there and each of them work with varying degrees of success. Some are definitely more budget-friendly than others. Freezer cooking is when you make freezer meals ahead of time—meaning you'll often complete prep and cooking all at once, freeze the meals in bags, then, when you're ready, simply pull them out and reheat or finish cooking in the oven. Freezer meals are great because you can cook once and eat off them all week (or for several weeks). To make freezer meals, you’ll need some gallon-size freezer bags, casserole dishes, and a marker to label each meal. Freezer meals work great if you have a few hours each week to do the cooking (like on the weekends). The meals range in options, but often include casseroles and dishes you bake to reheat. Freezer meals can be very budget friendly because many use meat sparingly and allow you to make the most of budget-friendly ingredients like frozen veggies. Pretty similar to freezer meals, dump meals are made in advance, frozen in bags, and then “dumped” into the slow cooker to reheat. Dump meals are often soups, stews, and saucy dishes (all budget-friendly) that cook well over long periods of time. Dump meals are great for slow cooker fans and many don’t have to be precooked beforehand. You simply dump the raw ingredients in the bag, freeze, then they cook in the slow cooker later. Easy! There are TONS of dump meal recipes and plans out there for freezer cooking and dump meals. For both, I LOVE MyFreezEasy. It’s a great planning tool, plus, you get labels, recipes, and everything you need. It’s really awesome. Another meal planning option is to just come up with quick and cheap meal plans that you can make in 15 minutes on weeknights. These include fast meals like precooked Tyson grilled chicken strips, instant pasta, sandwiches, and wraps. 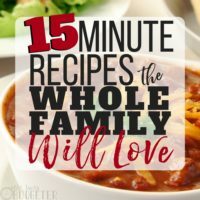 Check out my 15 minute meal resources for ideas! I rarely spend longer than 15 minutes in the kitchen, so I've gathered a bunch of recipes to get me in and out quickly. 15 minute meals are great and mine are all budget-friendly. 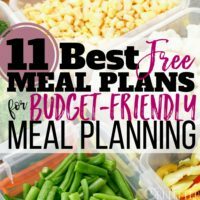 All of the meal planning options listed here are budget friendly, but backward meal planning is the cheapest. With backward meal planning, you buy what’s on sale or use what you have by “shopping your pantry and freezer.” So while most meal plans require you plan first, then form your shopping list and shop…backwards meal planning works the opposite way. Buy items on sale or go through cupboards to find items you already have. Sometimes stores will run great deals on certain cuts of meat like pork loin, skirt steak, or chicken thighs. Pick up the sale cuts and figure out ways to swap them into recipes and round them out with a few simple sides. While this method is budget-friendly, it does require a few basic cooking skills and some ability to swap and sub-in recipes. For example, if chicken thighs are on sale (instead of breasts), you might need to use them in your chicken breast with rice recipe. You might need to trade spinach for another leafy green, or cheddar cheese for cheddar jack if that's what's on sale. If pre-seasoned rice packets or a certain type of pasta are on sale, you may want to stock up. This might mean changing up a side or using a different starch in a meal, but most are interchangeable and simple. Backwards meal planning is a great way to build up your cooking skills and most of the changes you’ll need to make are minor enough that your family will still go for it. The great thing about backwards meal planning is that you can literally make it out of the store with a week's worth of groceries for $20-40. I’m not even kidding. 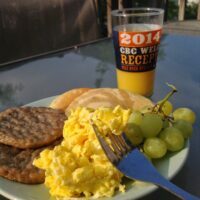 Keep breakfasts relatively the same (cereal, oatmeal, egg & toast, fruit). Lunches are either leftovers or simple meals like sandwiches, cold cuts, or peanut butter with chips, carrots, or fruit. Then, for dinners, buy the cheapest cut of meat and sides that are on sale, and use spices and sauces to change it up (marinara and pasta makes it Italian, rice and beans makes it Mexican, frozen veggies and soy sauce makes it stir fry). Neat, huh? You'll want to do as much meal prep and cooking on the weekends, so you can to save time on busy weeknights. So on the weekend you'll want to cook up rice and pasta, brown or grill meat, and chop veggies, for example. While this type of planning can be a little challenging for beginners, you might be surprised at how much you can save! One of the most important things to remember with budget meal planning is to keep it simple. Grill or sauté protein, microwave frozen veggies, and make a simple side of rice, pasta, or bread, or a simple salad to round out the meal. Eating the same things regularly really helps with meal planning. I mean, of course variety is the spice of life, but if you’re really trying to save money, you might have to forgo variety for a while and just stick with the easy meals you know your family likes. I promise your kids won’t mind eating grilled cheese or chicken strips once or twice a week and it'll certainly make life easier and help you to be successful. Don’t feel bad if you vow to cook at home more often and you're not magically whipping up from-scratch meals all the time. Restaurants don’t even cook every side from scratch. And hey, if your kids eat boxed mac and cheese or Rice-a-Roni, it’s not the end of the world. It’s still cheaper than going out to eat, and frankly, it’s probably no worse for them than fast food (probably lots better). We use salads as a side for many meals (sandwich with a side salad, soup with a side salad, or protein over salad greens). I just know to buy salad mix every week (pre-bagged: take help where you can get it) because we’ll use it up. Frozen veggies are great, too. Just buy a big bag of mixed vegetables and toss a handful in the microwave or steam on the stovetop. Add a little seasoning and butter and you’ll have a side your kids will gobble up. Be sure to buy the veggies you know they like—green beans, peas, carrots. It’s totally okay to have the same veggies every night. At least they’re eating something healthy, right? An apple works just fine for a dinner side. After all, if it’s good enough for a Happy Meal or Subway, it’s good enough for us! Kids tend to love cut up fruit more than veggies, and they’re healthier than potato chips (or cheese with a side of cheese, which seems to be at the top of the kid’s menu lately). One of the biggest costs when you go out to eat is in the beverages. Even non-alcoholic drinks add up on your bill. If you’re trying to eat at home and embrace meal planning, one of the best ways to reduce the cost is to drink as simply as possible. If your family can’t stand plain ol’ water, try adding powdered drink mix, which is super cheap, feels fancier, and will get your kids to drink more fluids. Buying a bunch of drinks really adds up. (Of course, if it will keep your family on track with budget dining, then by all means, stock up on fancy drinks, which are cheaper at the store than in a restaurant)! Need MORE meal planning help? No problem! Check out my Simple Meal Planning for Beginners – Step By Step Instructions post to walk through all the details of easy, beginner meal planning. 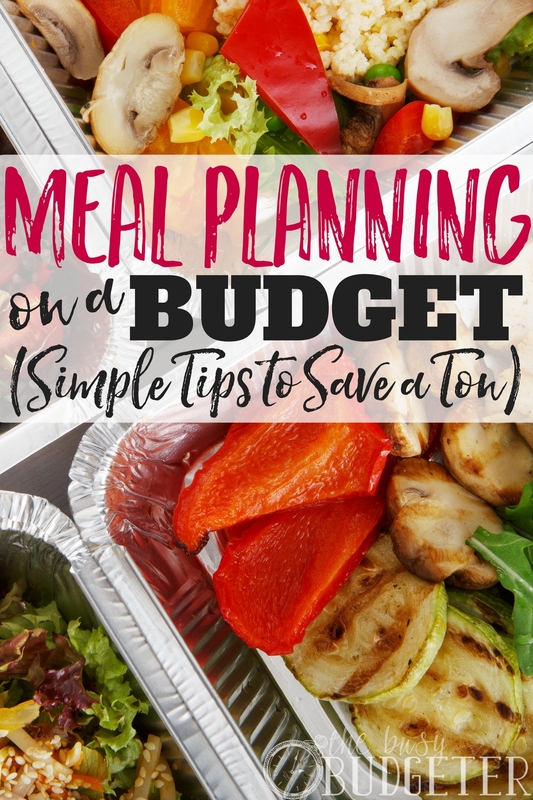 With a little forward thinking you can be a successful budget meal planner! You’ll be amazed at how meal planning really impacts your budget and reduces food costs. Food is often one of our highest areas of expense, but with some menu planning, you can cut it like crazy! Great article!! I have always struggled with meal planning but I knew it had to be done in order to cut back on our grocery budget. I started out with the backward meal planning method which works great for me. It helped me use up a ton of food I had stockpiled that I didn’t have a plan on how I would use it. This method has saved me saved me so much on groceries. I am now incorporating freezer cooking into the mix to help me stay on top of meals during our crazy busy days. Routine is my best friend, but I think my problem is not being creative enough with my meals. I’m such a lazy cooker, and I also don’t like spending more than 10 minutes at a time cooking food. I really need to start making more slow cooker recipes! Totally understandable! Trust me, you’ll get addicted. The slow cooker is a lifesaver! I have always struggled with meal planning. I tried using the different systems online, but nothing really stuck. Whenever I stop by there is a great useful lesson to learn here ! Thank you so much ! I really needed to read this! We are eating healthier than we have in the past, while trying to budget, and cook things everyone will eat… to say the least, I am about to go crazy! After reading this, I realize I need to keep it simple until I get more comfortable with meal planning and grocery budgeting. After I get those down, then maybe get a little more creative. Thank you for sharing! I’m so glad you posted this. My meal planning has been thrown off recently and I need to get back on track. These tips are super helpful! Maria @ Leisurely Does It recently posted…Should You Pay Off Debt Or Save Money First? Great post! Been trying to fix my schedule to squeeze in some time for to go homemade food. Good thing I stumbled upon this article. Looking forward to more helpful posts. I just wanted to stop by and say that I really enjoy your site. 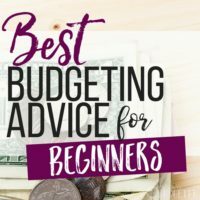 There’s a lot of really helpful information to benefit from and I’m always interested in more ways to save money. I like stopping in each week to see what’s new. Very well written article. I was on tight budget few years ago as well, and it was really painful to eat healthy, attend gym and moreover try eat tasty while not having many bucks in your wallet. I have overcame those obstacles, but your article is really helpful for anyone who haven’t yet! You had composed great article. I was on tight spending couple of years prior also, and it was truly difficult to eat healthy, go to exercise center and additionally endeavor to eat top notch while not having many bucks in your wallet. I have beaten those snags, yet your article is truly useful for anybody. Who hasn’t yet?